I received a lovely purple NamaSTAY Yoga Mat Towel that is non-slip. It has sleeves at both ends that wrap around your yoga mat, so it always stays in place. This is awesome for any hot yoga practice, as when you're moving around from posture to posture you don't want your towel to move with you. I've been practicing a lot of Bikram yoga classes lately, so this yoga mat towel is just perfect, as it's super soft and absorbs all the sweat. I really love the soft plush material of this towel, as it feels nice on my skin, especially when I'm relaxing in savasana. Most yoga towels are thin and feel a bit rough on your body, but this one is extra soft with more cushion. The hours spent on a yoga mat should be enjoyable for your body, and this NamaSTAY yoga towel is super comfortable and luxurious. This towel is light weight, machine washable, fast drying, and fits all standard size yoga mats. 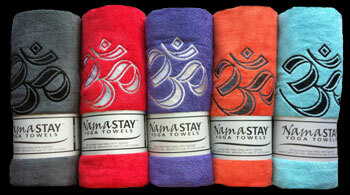 It makes a perfect gift for any yoga enthusiast, as it's the only towel one would need for their hot yoga practice.